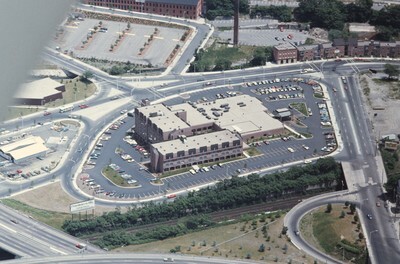 Designed by Py-Vavara architects, this photo shows the Marriott Hotel soon after its completion, erected upon ground that had previously been cleared for the construction of I-95. At the time the long-standing Biltmore Hotel in downtown was closing its doors and the Marriott served as a replacement. However, the Biltmore was rehabilitated in the late 70s by the Chamber's Providence Foundation. The Marriott, suffering from its ample but distant feeling parking lot surroundings and misuse of space, still contests the Biltmore. The Marriott however does not have the Biltmore's historic standing. Bibliography: Woodward, Wm McKenzie. PPS/AlAri Guide to Providence Architecture. Providence Preservation Society, 2003. pp. 290. Woodward, Wm McKenzie and Edward F. Sanderson. "Providence: A Citywide Survey of Historical Resources." Rhode Island Historical Preservation Commission, 1986, pp. 170, 207. Smolski, Chet, "Providence Marriott Hotel (aerial)" (1976). Smolski Images. 59.